How to taste olive oil and get lost in an Iris field! How to taste olive oil and get lost in an Iris field? Come to Tuscany and you will see! We spent one of the most remarkable week with one of the most fabulous group of ladies we’ve ever met. 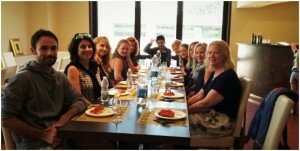 Exploring together the real beauty of our Tuscan region, learning stories, tasting delicious products and was very fun. 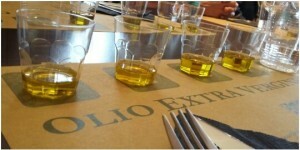 We spent a day at our treasured olive oil farm, discovering all the secrets about high-quality extra virgin olive oil. 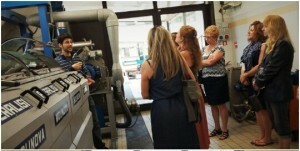 We started our day with an interesting tour of the oil mill given by Emanuele, our friend & olive oil expert, who shared with us his deep knowledge about this unbeatable element of Tuscan cuisine and lots of “behind the scenes” olive oil facts, followed by a professionally certified extra virgin olive oil tasting. Not only we’ve tasted some of the most highly rated olive oils in Tuscany, we’ve also learned about the best uses and food pairings that showcase each and every ingredient. Visiting this farm in Spring time means to get closer to the charming “olive oil world” and having the unique opportunity to get lost in the stunning Iris fields in full bloom! Indeed, from the mid of April until the beginning of May it is possible to assist to the breathtaking spectacle of liliac iris flower’s fields in full bloom. These, also called “Giaggiolo”, is the symbol of Florence already from Middle Age. The very delicate fragrance comes from the roots. 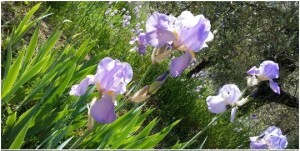 Most of famous parfumes of the world have contains the iris fragrance. Thanks Emanuele for the experience and thanks to our wonderful ladies for all the joy and the beautiful company. Certanly, we will see again!